Zaksee Parrot Sanctuary was established for one reason only, to “provides a loving home for parrots that truly need us”. We cannot do that without your help. Kindness, caring and compassion is what Zaksee Parrot Sanctuary is all about. We are here for parrots that really need a loving home. We are a safe haven for parrots that can live the remainder of their days in a loving environment. Our aviaries are extremely spacious which allow our parrots to fly freely and use those big beautiful wings as intended. Having to surrender your feathered companion is sometimes a difficult decision to make. We understand that sometimes due to life’s circumstances, there is no other alternative. We will be here to make this transition as easy as possible for you. Zaksee Parrot Sanctuary was established for one reason only, to “provides a loving home for parrots that truly need us”. Zaksee Parrot Sanctuary is located on well over 200,000 square feet, surrounded by rolling streams of fresh water and luscious greenery. The ambiance of our sanctuary is breath taking. Each and every bird on this property receives our undivided attention. If you need to place your parrot – contact us by email, phone or use our contact form and we will work with you. We are not about numbers but all about providing each parrot the attention they so desperately deserve. We do have an extensive waiting list, however, those parrots requiring our immediate attention, we will truly try to accommodate. We are located in the Tampa, Florida area and request you contact us for appointments for your visit. 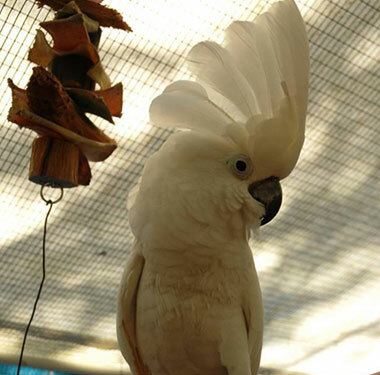 We do encourage you to visit if possible when considering placing your parrot into our sanctuary. We also encourage you to contribute in any way possible. Financially or by volunteering. Volunteers make a difference in this world! Zaksee is a 501(c)(3) designated not-for-profit charity. A copy of the official registration and financial information may be obtained from the Division Of Consumer Services by calling toll-free (800-435-7352) within the state of Florida. Registration does not imply endorsement, approval, or recommendation by the state. Every dollar helps and 100% of your donation is tax deductible and goes directly for the rescue, rehab, a forever home. While allowing the birds to have the freedom to be a parrot and to fly again.